Within Berlin’s thriving Embassy Quarter resides the dynamic SO/ Berlin Das Stue, a historic building first constructed in 1938. Das Stue served as the Royal Danish Embassy for the better part of four decades, falling into considerable disrepair once the Danish government sold the building during the late 1970s. However, the building gained a new lease on life several years later, when city officials rescued Das Stue. They transformed the site into an office complex, which the Deutsche Bundespost and Deutsche Telekom used as a training facility for a while. Das Stue finally became a hotel in 2009, after the brilliant architectural firm Axthlem Architects completed an extensive renovation of the building. 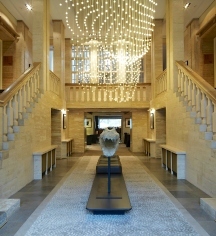 SO/ Hotels and Resorts now manages this marvelous historic hotel, operating it as the luxurious SO/ Berlin Das Stue. SO/ Berlin Das Stue features 78 splendid guestrooms and unique suites to choose from for all types of travelers. All accommodations contain the best modern amenities, including comfortable king-size beds, Ultra HD entertainment systems, and spacious baths. Some of the suites, like the Bel Etage Suite, Penthouse Suite, or Signature Stue Suite, offer benefits like freestanding bathtubs, limousine service, a personally designed Welcome Bar, or complimentary laundry service. The Das Stue possesses two celebrated restaurants that are certain to satiate any palette: Cinco by Paco Pérez and The Casual & Terrace. Both restaurants serve the finest Mediterranean cuisine, inspired from the genius of distinguished chef, Paco Pérez. Das Stue also offers the luxurious Susanne Kaufmann™ Boutique SPA, where guests can revel in the holistic treatments given by the expert spa staff. Guests can also reserve the picturesque Bel Etage Salon or Private Dining Salon for all kinds of social gatherings, including cocktail receptions, business meetings, and lively weddings. As an added benefit, guests have exclusive access to the adjacent Berlin Zoo through the bar's terrace. Das Stue is tucked away into a lush corner of the city’s embassy district, bordering the Tiergarten Park and the Zoologischer Garten Berlin. In fact, Das Stue’s modern wing faces the zoo’s outdoor exhibits that display ostriches, antelopes, and Przewalski horses. Guests can stroll past the zoo to view the many different embassies that fill the city’s vibrant Embassy Quarter. The hotel's central location in Berlin places it within a short distance from numerous cultural institutions, such as the Kulturforum and the Berlin Philharmonic. Shopping enthusiasts will marvel at the many shopping centers and stores situated nearby, like the Kurfürstendamm and the legendary KaDeWe. Within walking distance of the hotel are many famous landmarks that allow guests to delve deeply into German history, such as Potsdamer Platz and the Brandenburg Gate. There is always something exciting to explore outside of the SO/ Berlin Das Stue. 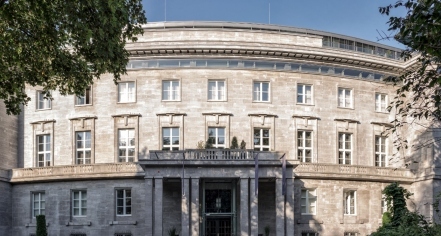 SO/ Berlin Das Stue, a member of Historic Hotels Worldwide since 2018, dates back to 1938. Das Stue was originally constructed from 1938 to 1940 as the Royal Danish Embassy by Johann Emil Schaudt, the architect of Berlin's famous KaDeWe department store. Deposit: A deposit may be required, depending on rate. Hotel/Resort Fees & Taxes: The city of Berlin charges an overnight stay tax of 5% on the room accommodation rate. This tax is not included in the rates. The tax will be charged upon departure in the hotel. Business travelers are exempted from this tax. Pet Policy: €40 per pet and night. Rollaways: €50 per bed for an adult per night, for children under the age of 12 years extra beds will be provided free of charge. Smoking Policy: All rooms are non-smoking; smoking is permitted on the terrace as well as on balconies/terraces belonging to rooms. Within Berlin’s thriving Embassy Quarter resides the dynamic SO/ Berlin Das Stue, a historic building first constructed in 1938. Das Stue served as the Royal Danish Embassy for the better part of four decades, falling into considerable disrepair once the Danish government sold the building during the late 1970s. Learn more about the History of SO/ Berlin Das Stue .